How does San Diego Tourism see Social Media and Bloggers? This is the first of an ongoing series talking about social media and the travel industry. I find it fascinating that there is a whole industry devoted to semi-professional travel blogging today, yet almost no one ever asks "what are they looking for". On the other side, the PR people at the travel brands are almost afraid to ask us for specifics out of concern that it may cause a bad reaction or interfere with the individual telling the story. To help shed some light on this challenge I set out to interview a series of 10 travel brands that work with bloggers to learn more about what they are looking for when working with bloggers as well as social media in general. Read more: How does San Diego Tourism see Social Media and Bloggers? 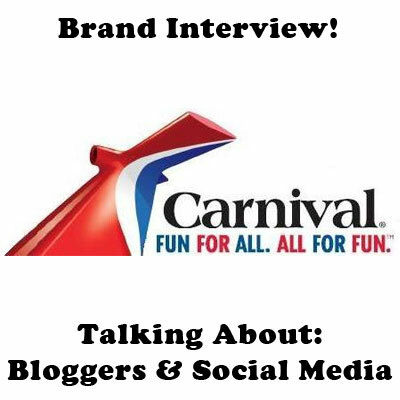 How does Carnival Cruise Lines see Social Media and Bloggers? In our second interview of this series, we talk with Joyce Olivia, PR at Carnival Cruise Lines. As you know, we are HUGE fans of Carnival and I think they are one of the top travel brands out there that really understands how social media and the travel industry have come together to extend the experience that most people will only be able to experience for a few days each year, into something that they plan, dream, and remember all year long. Read more: How does Carnival Cruise Lines see Social Media and Bloggers?